before another winter will roll in, it's high time to end my series on south korea where i had a 5-day trip last winter. i had already come up with 12 posts and i have no idea anymore what clumsy words i wrote and what kind of unimpressive photo edits i posted. both then became what i pompously called as narrative. on top of those previous 12 posts, i'm still coming up with a final post which i dearly hope that it won't be as long. but then again, i can't promise that. i have in mind that obtaining travel visas in singapore is easier than back at home. one obvious fact for me is that most embassies are in manila and visa application is a lot more complicated for someone like me who's from cebu. even so, if there's a will, there's always a way! anyway in singapore, visa requirements are posted on the website of the south korean embassy and tourist visa application is for free for filipinos. no appointment is necessary. what i did was i showed up early before the embassy opened at 9am. the embassy's receiving area was already open and upon getting the queue number from a machine, i whiled away by watching a korean TV show in the lobby. i also noticed a desktop computer and a printer, which can be helpful in case one forgets to print a document or a photocopy. when it was my turn, the korean behind the counter, reviewed my documents under 5 minutes and i was then told to come back after 3 days. flight confirmation and hotel booking are not necessary but nonetheless, i still attached my accommodation booking and it wasn't discarded by the lady in the counter. with the tourist visa out of the way, let's now hop on a plane to south korea! however that idea seems impossible right now. let me do a full retrospect instead. my trip fell on the lunar new year holidays and the flights that time were crazy expensive. however, i did bite the bullet and by doing so, i booked my direct flights with singapore airlines. i was supposed to book with asiana airlines earlier which was a tad cheaper but for some reason, the idea disappeared into thin air. my only consolation with singapore airlines was that i'm accumulating krisflyer miles (thanks to credit card points) but because i don't fly expensively very often, i'm still far behind from that free one-way trip to home. i hope i can reach the required number of miles before they get expired! another advantage of flying direct to south korea was that it maximized my time. my outbound flight left singapore at midnight and i arrived in incheon airport early in the morning. meanwhile, my inbound flight arrived in singapore at 10 in the evening, having left from incheon airport at 4 in the afternoon. a piece of advice though. book in super advance when flying during the lunar new year holidays and if you can avail the air asia flight from kuala lumpur, so much the better and earlier the better. when i booked three months before my flight, air asia also inflated their prices! hurrah! i already have a post about this. beware. it's another lengthy one. it's not very hard to choose where to stay in seoul as there are plenty of options, from the luxurious ones and of course, to the most economical ones. with the lunar new year holidays however, the accommodations that my wallet could take were already fully booked and those accommodations were supposed to be near the famous go-to places. but all is well that ends well. i bunked out for 4 nights in hi seoul youth hostel and stayed in a 6-bed dorm type room (all-female), my first time to stay in such type. it felt like college days all over again except that we spoke different languages! the 2-year old hostel has a hotel-feel into it, with very spacious lobby and standby receptionists to address any needs. with 8 floors in total, the hostel building stands strikingly tall. the only thing that reminded me that it's not a hotel was that i shared my room with other 5 girls. i also had no complimentary breakfast. 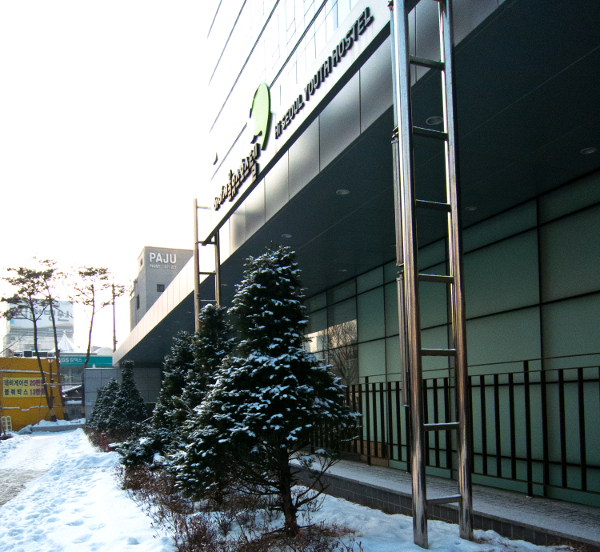 the location of the hostel in yeongdeungpo was not an issue for me because i almost idled my time there. no pressure. no running around to see many places in limited time. and it was during the dead of winter, for goodness sake! my only complain was that the room was uncomfortably stuffy due to the centralized heater, set to the extreme. my hostel-provided blanket was left with no use and i wish somebody could turn on the aircon or in that case, open the windows (not!). i already did this one too. yay! in case you get hungry in the middle of this post, here's some food inspiration. seoul is a huge city, so huge that you can't quite determine the exact center of it. the city is composed of many adjoining districts and a district can even be regarded as a city itself. however, getting around is still easy-peasy and thanks to the extensive subway network in seoul. on the other hand, it is also easy to reach other places in south korea from seoul as the country has good railway connections all throughout. aside from subway trains, seoul's public transport is made even more convenient through buses. 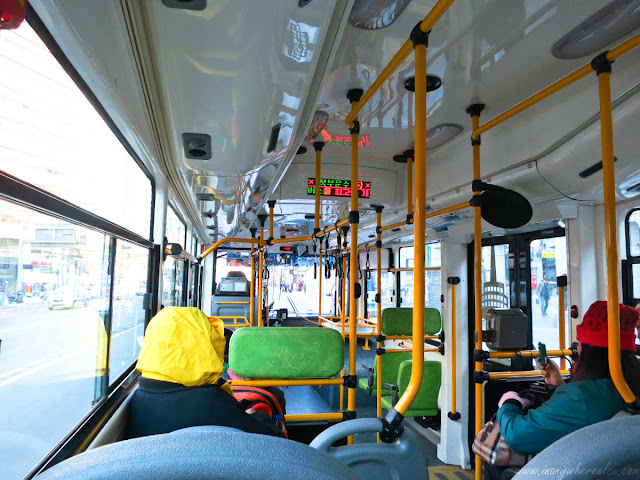 buses are a little difficult though because bus stops are generally only in hangul and as well as the bus route maps displayed at the bus stops. i had tried riding the bus thrice. 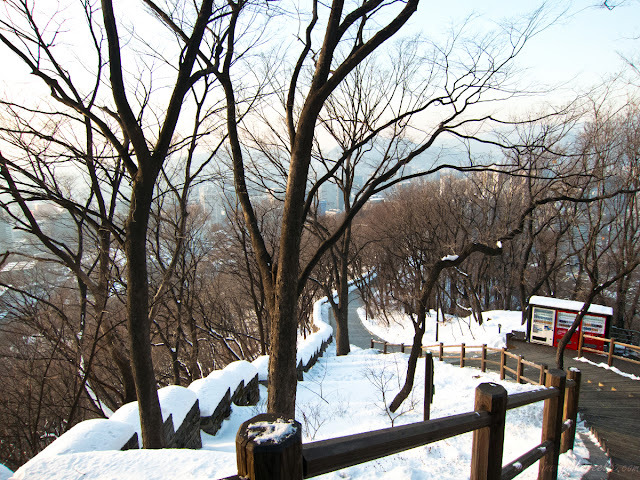 first was when i went to the namsan tower and it was straightforward as the last stop is on top of namsan, unless it doesn't get more obvious than that. the second one was with my high-school girl guides and i was strutting behind them as they figured out which correct bus to take. the third and the last one, was when i tailed the locals to get on a bus from the gapyeong station to the nami wharf and that also worked perfectly! in order to experience the convenience in riding trains and buses in seoul, the key thing is to have the T-money card, a transportation card in south korea. there are other transportation cards as well, depending on your needs and preference. reloading the transportation card can be done in train stations. 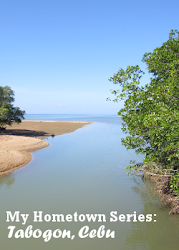 i knew beforehand that my hostel is a considerable walk from the nearest train station. i even planned to get off from a different train station, a little bit far so that hailing a taxi would be reasonable. this was what i planned before i landed in seoul. but when i got there, i bravely walked in the freezing cold night. since my hostel is away from the hustle and bustle, i was only able to bump into a handful of people during the walk but i still felt safe. at all times though, i went back to my hostel not later than 9pm. during my planning phase, i happened to read about the likelihood of coming across intoxicated men in the streets. drinking seems to be a major part of the korean culture and it can be considered as their important form of socializing. drinking over there even comes with an etiquette. true enough, i came across intoxicated men in a number of instances and sure is, my heart skipped a beat the first time! i just feigned nonchalance and continued to walk as if nothing had happened. other than that, everything went just fine. yes, even if my lack of korean language skills, i still did survive! getting around is possible since directions at train stations, are also in alphabet. i was able to recall a couple of greetings like annyeonghaseyo and kamsahamnida and that alone did wonders. of course, one dependable fall back is the sign language! it was my first winter in my entire existence and i only then had jersey jackets and blazers to fight off an aircon cold weather, a very pale comparison to the korean winter. to prepare myself for the grand torture which was of my own doing, i stocked on thermal wears for my inner clothing. i just bought enough pieces from the heattech line from uniqlo -- shirts, warmers, socks, and leggings. thankfully, they all worked for me. it is also a very good idea not to skimp on a good winter jacket because winter cold is a no joke. as for my shoes, they were only of leather type and even if i piled on three pairs of socks (each in varying thickness), my feet still went numb after several hours in the outdoors. winter boots may be a better alternative. i also brought mittens but it was too cumbersome to wear all the time, especially when i was using my phone and camera. the heat packs inside my pockets did the trick though! lest the temperature drops to -20s degree celsius, then it's time to head to a café to warm yourself with a cup of steaming hot coffee. once you gain back your senses, head back again outside to frolic in winter wonderland!